Our staff is available to assisting with bring out and clean the large garbage bins for commercial buildings and each night our personnel will completely empty all of your trash cans and replace the can liners. After emptying the trash, we will neatly place the trash cans where they belong. We understand that not all the floor surfaces are the same that’s why we use neutral floor cleaners to avoid damages to the floor surfaces or floor finishing. For both commercial and industrial cleaning our personnel will be sweeping or mopping the floor surfaces on daily basis while we pay special attention to clean the edges and corners and underneath light furniture. HAN Cleaning personnel will dust and clean all furniture and vertical surfaces. We will detail dust desks (if desired), file cabinets and horizontal surfaces. We will perform high-low dusting of picture frames, door frames, etc. We will dust all window ledges, window sills, window frames, blinds and baseboards and remove cobwebs from windowsills and baseboards. Wiping/polishing light switches, glass doors, etc. With our personnel around the clock we will polish all glass (mirrors and doors), metal (partitions and drinking fountains) and bright work in your building. We use spray disinfectant cleaners and wipe the entire surface with cotton cleaning rags until the surface is clean. We do not leave smears or residue. At the customer’s request we provide carpet cleaning, stripping, waxing, buffing, treat tile floors and construction cleaning. 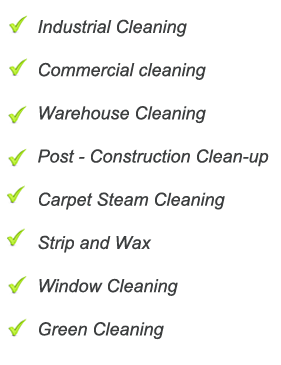 We can satisfy all of your carpet cleaning needs, including comprehensive carpet cleaning and spot removal. We use low residue chemicals to reduce stains caused by chemical residue. Our personnel will thoroughly rinse and clean your floors with a neutral cleaner. For buffing we will sweep and clean your floors with a neutral cleaner-restorer. Then, we will buff your floors with a high speed buffer. This process will give a bright shine to your floor and increase its life expectancy. Finally, our personnel can handle all of your construction cleaning needs. When we perform comprehensive construction cleans, we will make multiple visits to the site throughout the construction process. After construction is completed, we will clean the entire facility and make it ready for the next phase of construction or move in. © 2014 HAN Cleaning Services Ltd. All rights reserved.